In Latin, the only word that’s ever been used for being harassed by a fallen angel is ossessione. English speakers have a difficult time with this word, and pedantically transliterate os-sessione (ob-sessione) as obsession, and then, getting rid of the preposition “ob-”, we add “pos-” to get possession, as if that made things all the more serious. Now, in Latin, “ossessione” has nothing to do with our post-Freudian psychologized perspective on obsessive-compulsive disorder. No. Instead, in Latin, “ossessione” refers to being held hostage, to being under siege. It is quite an exact fit, that. 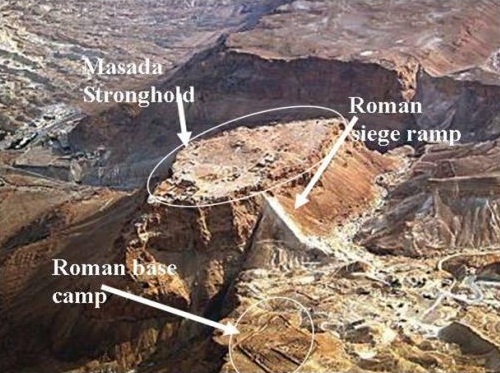 As in the picture of Massada under siege by the Romans, where those inside the walled fortress were safe and self-willed, as least for a while, just so is the soul of the person who is under attack from a fallen angel. They have their free will intact, and cannot be forced to agree to what Satan is doing against them. Of course, such souls, like those in Massada, are under a great deal of pressure. Some, like those at Massada, commit suicide if they are without help, or if they are treated like a nuisance. Not good. Always be good and kind, ever so gentle with those vulnerable people who have come to you for help, who are often on their way to committing suicide, but decided to come see you first. Think long and hard on that. See things from their perspective. It is very true, of course, that many of those who will ask for your help are merely psychologically obsessed with the devil, that is, even though Satan has never once bothered them, they are convinced that he is after them all the time and in every way. These people do not need an exorcist for exorcism, but it would be good to give them words of encouragement and to know how to send them on their way for the help they need. But, again, you may be the last stop also for them before they go off and commit suicide. Always be gentle with such vulnerable people who come to you for help. It’s good to know yourself, what bothers you. For instance, I know that I dislike it when people say they are harassed by the devil, but are saying that only to make themselves seem important, to get attention for themselves. They are plenty of such people. But, again, always be good and kind. This disarms even such people as this.